The following plates come from the Encyclopédie published in France by Denis Diderot and his co-authors in the 1750s. The originals appear on large (9'' by 14'') copper engravings in the "Plates" volumes, under Blason-Art Héraldique. 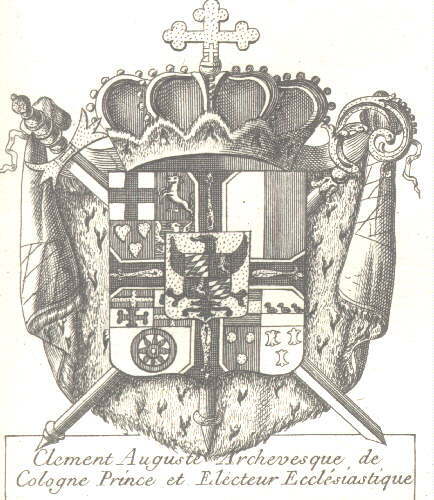 The heraldry entries were written by the chevalier de Jaucourt. The plates are not free of errors, by far, and I have made corrections in some places. The dates are those of reigns. The pictures are about 50K in size. This collection constitutes an armory of European nations in 1763. 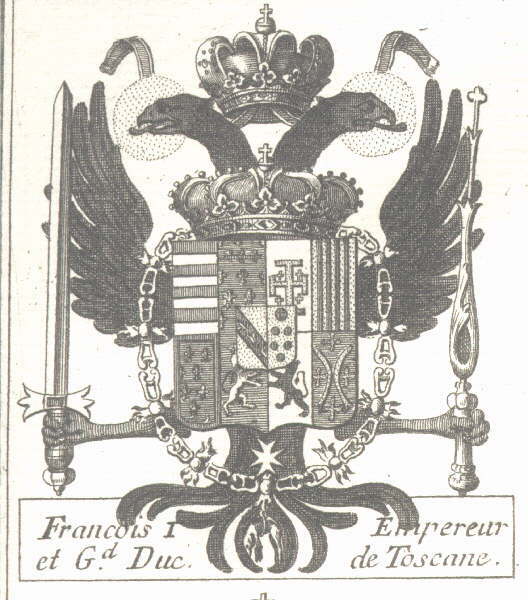 Holy Roman Empire: Francis I, Emperor and Grand-Duke of Tuscany (1745-65). Quarterly 1: Hungary and Anjou-Naples, 2: Jerusalem and Aragon, 3: Anjou and Guelders, 4: Jülich and Bar, over-all Lorraine and Tuscany. The shield, surrounded by the Order of San Stefano and the Order of the Golden Fleece and surmounted by a royal crown, is born by a double-headed eagle sable armed, beaked and tongued gules, holding a sword and a scepter, and crowned by an imperial crown. France: Louis XV the Beloved, King of France and Navarre (1715-74). Per pale France and Navarre. Surrounded by the Orders of Saint-Michel and Saint-Esprit. 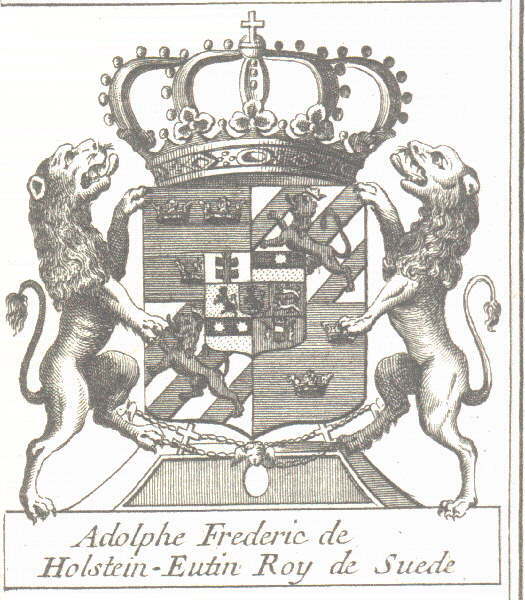 See the page on the the French royal arms. 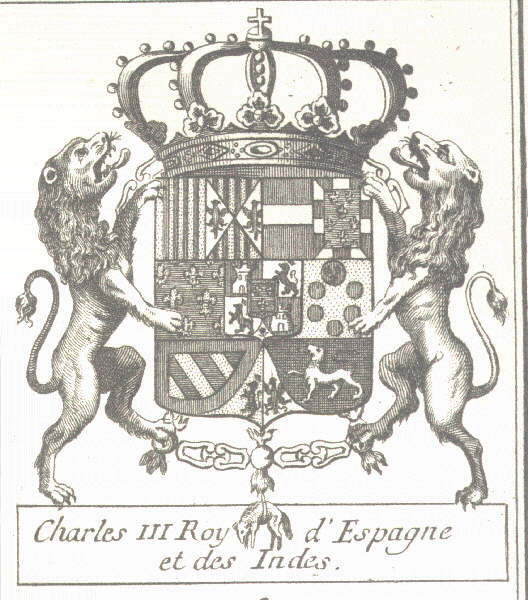 Spain: Carlos III, King of Spain and the Indies (1759-88). Quarterly of six in three rows: 1: Aragon and Sicily, 2: Austria and Burgundy modern, 3: Farnese, 4: Medici/Tuscany, 5: Burgundy ancient and Flanders, 6: Tirol and Brabant, sur le tout quarterly Castile and Leon, sur le tout du tout Anjou. Note that Farnese is mis-represented as France on the plate. The shield, surrounded by the Golden Fleece, is supported by two lions or and surmounted by a royal crown. See the page on Spain. Naples and Sicily: Ferdinando IV, Infante of Spain, King of Naples and Sicily (1759-1825). Per pale of three lines: I. Per fess azure semy-de-lys or [read: Or six fleurs-de-lys azure] (Farnese), and per pale Portugal, bendy of six or and azure a bordure gules (Burgundy ancient) and or a lion sable (Flanders); II. per fess, 1, per pale quarterly gules a tower or (Castile) and argent a lion gules (Leon) and per saltire or four pales gules and argent an eagle sable (Sicily), and 2, Azure semy-de-lys or a label gules (Naples); III. or six balls 1, 2, 2 and 1, on that in chief azure three fleurs-de-lys or and the others gules (Medici). Over all Azure three fleurs-de-lys or anda bordure gules (Anjou). Constantinian Order of Saint George. The arms contain a large number of inaccuracies. See the page on Naples. 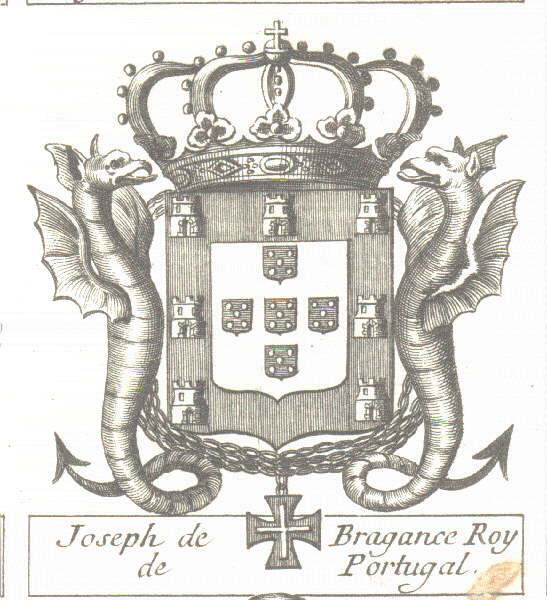 Portugal: José Manoel of Bragança, king of Portugal (1750-77). Argent, five escutcheons azure on each as many plates in saltire, all within a bordure gules thereon seven castles or. Supporters: two dragons proper. Order of Christ. 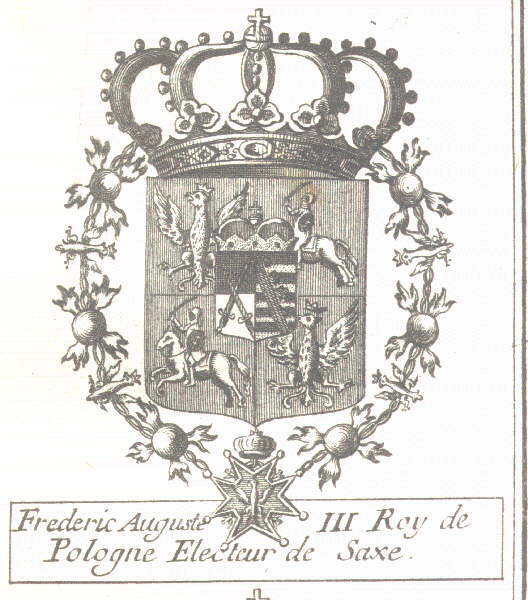 Poland: Frederic Augustus III, king of Poland and Elector of Saxony (1733-63). Quarterly Gules an eagle displayed argent, armed and beaked or (Poland) and Gules a knight on his horse argent, holding a sword of the same and a shield bearing azure a Patriarchal cross or (Lithuania), over all per pale, per fess sable and argent two swords per saltire gules and barry of ten sable and or over all a crancelin vert (Saxony). The arms impaling Saxony represent the Arch-Marshalship of the Empire. Order of the White Eagle. 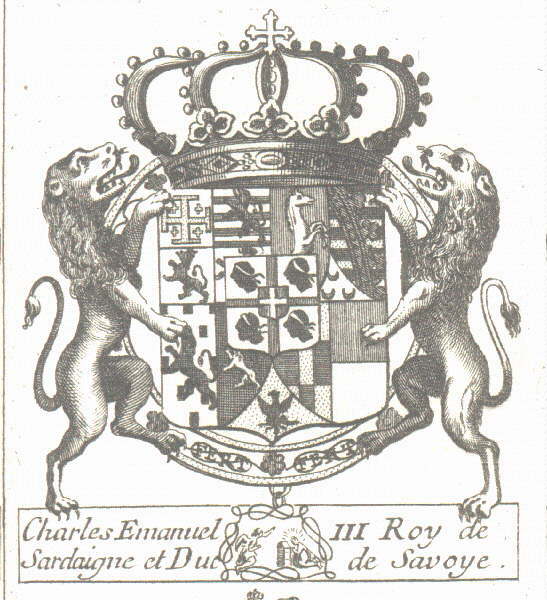 Sardinia: Carlo Emanuele III, king of Sardinia and duke of Savoia (1730-73). Quarterly: 1, quarterly Argent a cross potent between four crosslets or (Jerusalem), barry of eight argent and azure a lion gules langued and crowned or (Lusignan), Or a lion gules armed and crowned argent (Armenia) and Argent a lion gules tail forked armed and crowned or(Luxemburg); 2. per pale Gules a horse courant argent (Westfalia) and barry of ten sable and or a crancelin vert (Saxony), enté in base Argent three nenuphar leaves gules 1 and 2 (Angria); 3. per pale Argent billety and a lion sable armed and langued gules (Chablais) and sable a lion argent armed and langued gules (Aosta); 4. per pale chequy of nine panes or and azure (Genevois) and Argent a chief gules (Montferrat). Enté in base Or [read Argent] an eagle rising crowned sable (Nice). 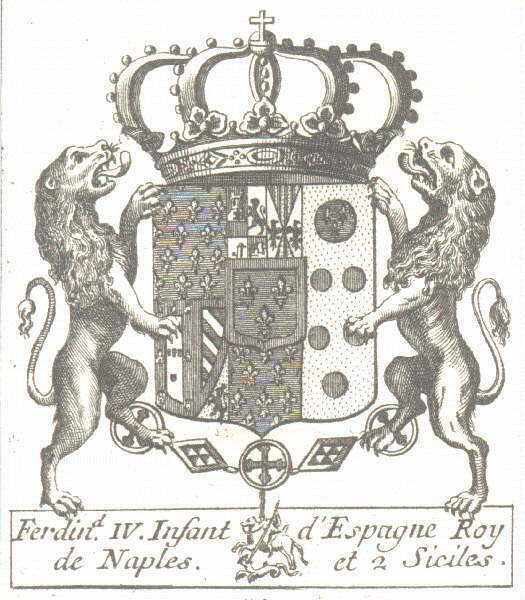 Over all an escutcheon rgent a cross gules between four Moor's heads couped sable banded of the first (Sardinia) and sur le tout du tout Gules a cross argent (Savoie Modern). Order of the Annunziata. 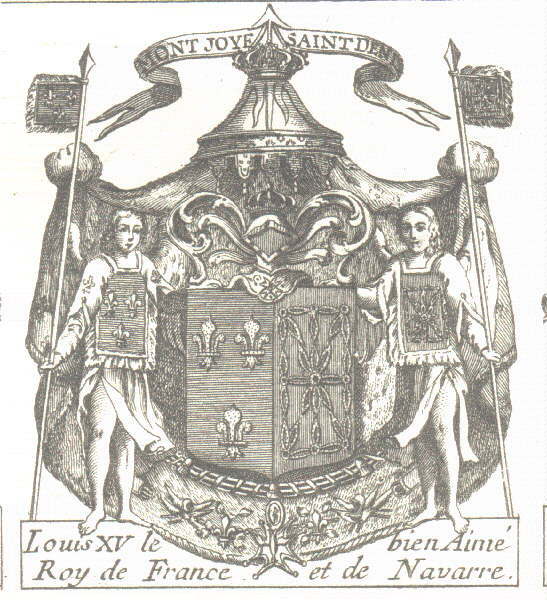 The arms of Savoy are discussed in greater detail in the page on Italy. 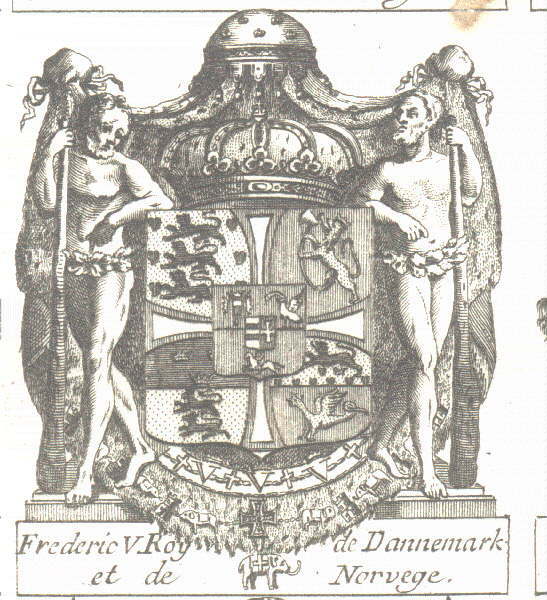 Denmark and Norway: Frederick V, king of Denmark and Norway (1746-66). Across argent fimbriated gules between four quarters: 1, Or, on a semy of hearts gules three lions passant azure per pale, armed, tongued and crowned of the first (Denmark); 2, Gules a lion crowned or maintaining a battle-axe argent handled or (Norway), 3, per fess Azure three crowns or (Sweden) and Or two lions passant azure per pale (Slesvig), 4, per fess or ten hearts gules beneath a lion passant azure (the Goths ) and gules a wyvern crowned or (the Wends). Over all, per fess: 1, per pale, Gules an escutcheon per fess argent and of the field, between three demi-nettle leaves and as many passion nails in pairle of the second (Holsten) and Gules a swan argent (Stormarn), and 2, Gules a riding knight argent (Ditsmarken). Sur le tout du tout, per pale argent [read: or] two bars gules (Oldenburg) and gules a cross patty argent (Delmenhorst). There are minor inaccuracies in the depiction: see the page on Denmark. Sweden: Adolph Frederick of Holstein-Wettin, King of Sweden (1743-71). Quarterly Azure three crowns or and argent three bends sinister wavy azure over all a lion gules crowned of the field (Sweden). Over all quarterly of six in three rows of two: 1, argent a Lorraine cross gules (Hirschfeld), 2, per fess sable a star of 16 points or and or (Ziegenhayn), 3, or a lion passant guardant gules, armed and crowned azure (Katzenelnbogen), 4, gules two lions passant or per pale, armed and tongued azure (Dietz), 5, per fess sable two stars of 16 points or and or (Nidda), 6, gules an escutcheon per fess argent and of the field, between three demi-nettle leaves and as many passion nails in pairle of the second (Schaumburg); sur le tout du tout, azure a lion barry argent and gules, crowned or (Hesse). Order of the Seraphim. The first arms (azure three crowns or) have been attributed to Svealand and the second arms (argent three bends sinister wavy azure over all a lion gules crowned of the field) to Götaland, although that is incorrect. Great Britain: George II, king of Great Britain and Elector of Hannover (1727-60). 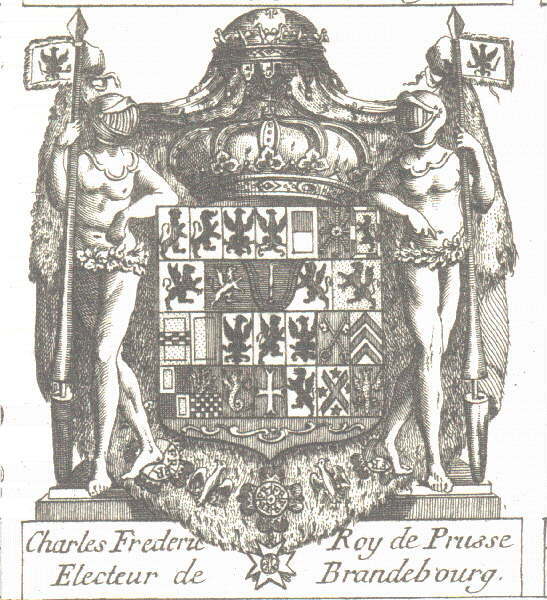 The arms: quarterly 1 and 4, grand quarter of England and France, 2 Scotland, 3 Ireland are incorrect (they are those used from 1603 to 1688 and 1702 to 1707). Order of the Garter. Prussia: Frederic II, king of Prussia (1740-81). Order of the Black Eagle. 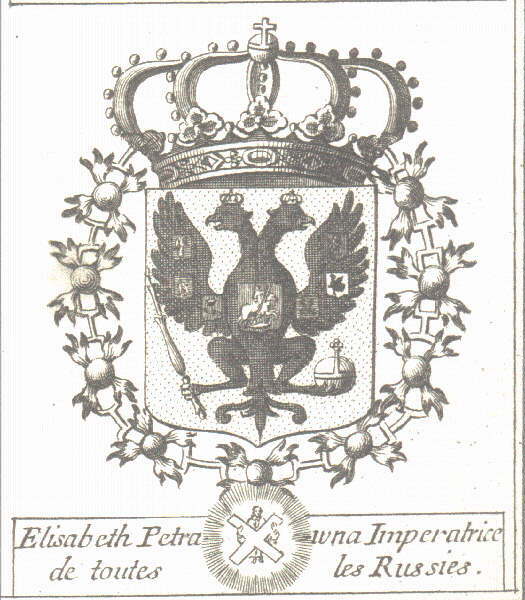 Russia: Elizabeth Petrovna, Impress of Russia (1741-61). 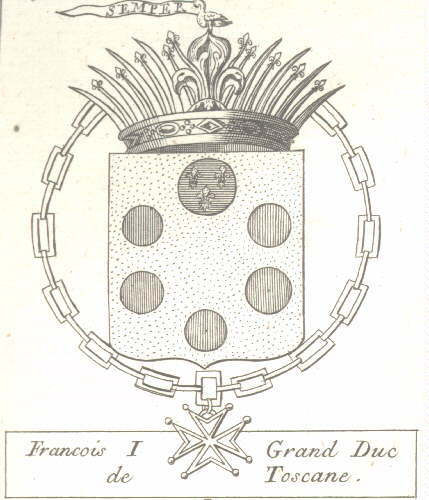 Tuscany: Francis I, grand-duke of Tuscany (1735-65). Or six balls 1, 2, 2 and 1, that in chief azure three fleurs-de-lys or, the others gules. The crown is peculiar to the grand-duchy of Tuscany. 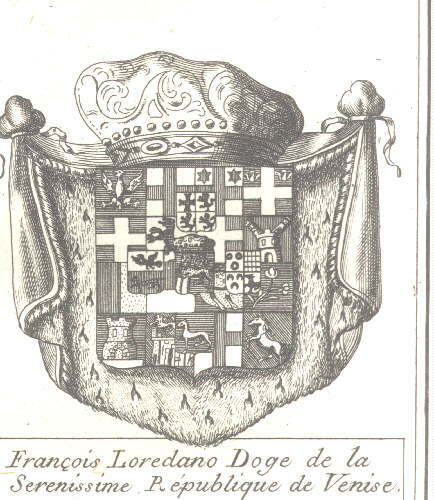 The fleur-de-lys flory in the center recalls the arms of Florence when it was a republic (before 1531). Order of San Stefano. See the page on Tuscany. Cologne: Klemenz August, archbishop of Cologne. I. quarterly argent a cross sable (Cologne), gules a horse courant argent (Westfalia), gules three hearts or [read: argent three nenuphar leaves gules] (Engern), azure an eagle argent armed and beaked or (Arenberg). II. Per pale argent and gules (Hildesheim). III. per fess, 1. quarterly gules a cross or and argent a cross anchory fules, 2. argent a wheel gules (Osnabrück). IV. Quarterly azure a fess or (Munster), argent three birds sable on a point gules, gules three bezants (Borckelo), and argent three cronels. Over all a cross patty sable, thereon a cross flory or, thereon an inescutcheon of the Empire with an escutcheon of Bavaria sur le tout. The cross patty sable and the cross flory or represent the fact that the Elector of Cologne is also Deutschmeister of the Teutonic Order. 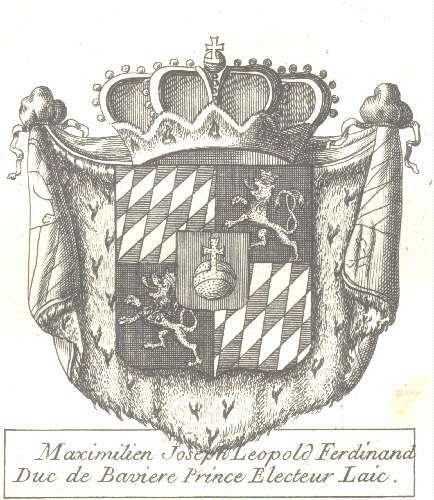 Bavaria: Maximilian Joseph Leopold, duke of Bavaria. Quarterly fusilly in bend argent and azure and Sable a lion crowned or (Wittelsbach-Pfalz), over all gules an orb or (Grand-Chamberlain of the Empire). Venice: Francesco Loredano, Doge of Venice. Grand-quarterly: I. Quarterly Azure an eagle or armed, membered, beaked and crowned gules (Friuli), argent a cross gules (Padova), Azure a cross argent [read: or] (Verona), Argent a lion azure armed gules (Brescia). II. Quarterly Argent a cross and two stars of eight points in chief gules (Treviso), Azure a cross and two dragons issuant in chief or (Belluno), Gules a cross argent (Vicenza), Gules a castle surmounted by two towers inclined toward the flanks argent, masoned and port sable (Feltre). III. Per pale gules and argent [read: or] (Bergamo), per fess gules and argent (Crema), Azure on a point vert a triple-towered castle on three steps or grieces, the middle tower higher, all argent, masoned sable (Adria), Vert on a two-towered castle or masoned and port sable a lion of Saint Mark of the second (Polesine). IV. Azure issuant from sinister flank the galley of the Argonauts or (Corfu), Azure a hyacinth flower slipped argent (Zante), Argent a cross gules (Cefalonia), Vert a horse rampant argent maned and unguled sable (Cherso). In chief, Cyprus, which is quarterly Argent a cross potent between four crosslets or (Jerusalem), barry of 8 argent and azure a lion gules armed and crowned or (Lusignan), or a lion gules (Armenia) and argent a lion gules (Luxemburg). In dexter Candia (or Crete), which is gules a minotaur argent armed purpure, on a chief argent an eagle rising sable, armed or, clasping a thunderbolt of the last. 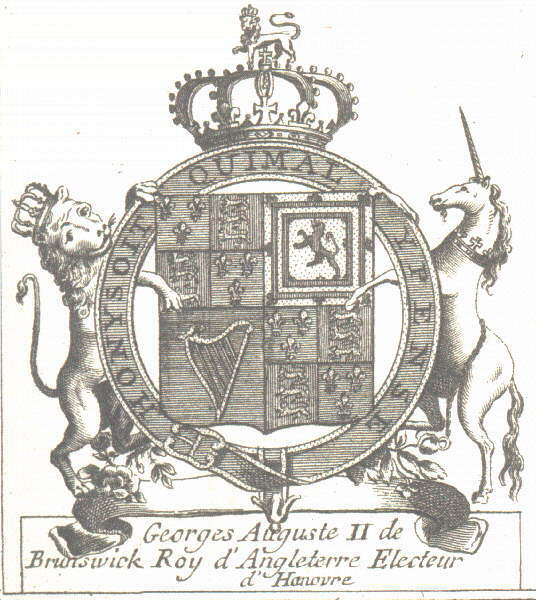 In sinister Dalmatia, which is quarterly Gules three lions' heads guardant or (Dalmatia), chequy gules and argent (Croatia), or three horseshoes sable (Rascia), and or a lion gules armed and tongued azure (Albania). in point Istria, which is Azure a goat passant or, horned purpure. In fess point Venice, which is Azure the lion of Saint Mark or, crowned with the dogal crown. The arms are surmounted by the cap of the Doge. 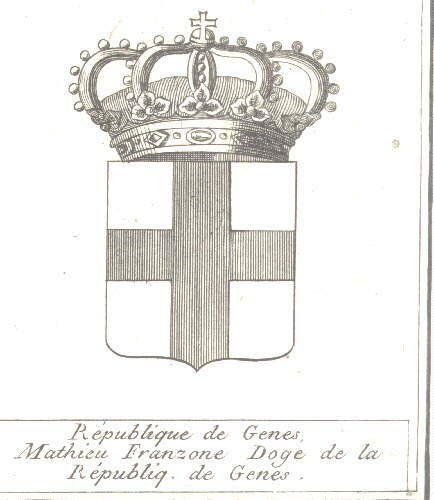 Genoa: Matteo Franzone, Doge of Genoa. Genoa adopted a closed crown on its coinage in 1637.